The ongoing series of patent wars between two of the world’s biggest technology giants, Apple and Samsung first began with Apple having alleged that Samsung Galaxy’s smartphones and Tablets infringed its design patents. Among the ten countries in which Apple had initially filed suits against Samsung, it won in Germany and Netherlands. Moving on to Australia, Apple succeeded in banning Samsung’s Tablet sales across the country, a further one week extension to which was recently granted. With everything happening so fast, it’s not easy to keep pace with the growing conflict as it continues in various courts all over the world. 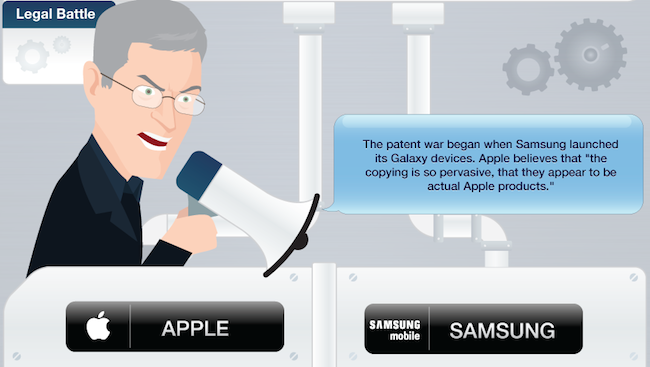 To make things easier for you to understand, below is an infographic detailing the patent wars between Apple and Samsung, highlighting some of the major events in this feud.